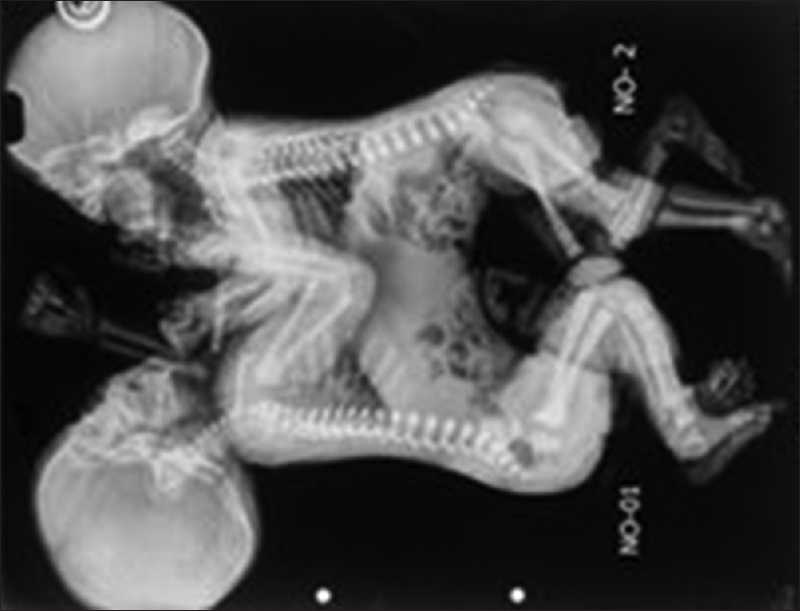 A conjoint twin is a rare congenital anomaly. The separation of conjoint twins presents a unique challenge to anesthesiologists. We report the anesthetic management of successful separation of thoraco-omphalopagus conjoint twins, along with challenges and limitations that we faced in perioperative period. We highlight the importance of a multidisciplinary approach, proper preoperative planning, and perioperative vigilance regarding monitoring and complication. The incidence of conjoint twins is rare, ranging from 1 in 50,000–200,000 live births, with thoraco-omphalopagus being the most common. The separation surgery of conjoint twins is always challenging for both surgeon as well as anesthesiologist. We describe our experience regarding the successful anesthetic management of thoraco-omphalopagus conjoint twins posted for separation surgery. 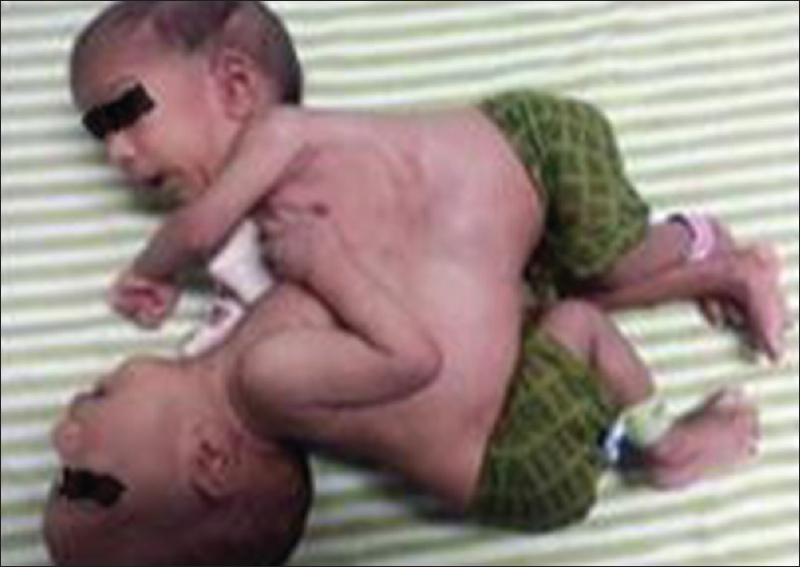 A 3-month-old male thoraco-omphalopagus conjoint twins was referred to our institute for separation. The twins were active, alert, joined ventrally from the manubrium sterni to umbilicus, and weighing 6.2 kg collectively [Figure 1]. During preanesthetic assessment both babies were properly evaluated for the presence of associated anomalies, extent of organ sharing, and presence of cross-circulation. Routine blood investigations, arterial blood gas (ABG), babygram, echocardiogram, and other studies were done [Figure 2]. All the investigations were within normal limits except hemoglobin which was 9.6 and 9.9 g/dl in both babies, respectively. Contrast computed tomography scan showed fused liver parenchyma and pericardium with no other evidence of organ sharing or cross-circulation. The other congenital anomalies, particularly cardiac anomalies, were excluded. The anticipated potential problems in perioperative period were discussed within the department, with pediatrics surgeons and neonatologists. There were two separate anesthesia teams with two anesthesia workstations and duplication of all the anesthetic drugs and equipment. One day before the surgery, rehearsal of anesthesia plan was done. The color coding (green and red) was applied not only on twins for proper identification but also on monitoring lines and infusion pumps with tubing. Routine anesthetic and emergency drugs infusion with calculated dose were kept ready for use. Even though both babies had same blood group, cross-matching for compatibility was done for each twin's blood products separately. Blood and blood products were made available in operating room (OR). Two intravenous (IV) lines including 24G cannula and one peripherally inserted central catheter were secured in each twin. Central venous catheter could not be inserted because of their complex head position. In the prewarm OR, standard monitoring was applied along with invasive blood pressure (IBP) and bispectral index (BIS) monitoring. The presence of cross-circulation was further ruled out as there was no increase in heart rate of second twin with atropine premedication of first twin. We were unable to observe BIS response of second twin on induction of first twin because of technical difficulty. Both babies were preoxygenated and premedicated with ketamine and dexamethasone [Figure 3]. Sequential inhalational induction and intubation technique was used. After sevoflurane induction and succinyl choline, the airway of first baby was secured with 3 mm uncuffed endotracheal tube (ETT) in third attempt and fixed properly. The second baby was induced and intubated in similar way. The anesthesia was maintained with sevoflurane, fentanyl, and atracurium. Along with standard monitoring, intraoperative monitoring also included IBP, hourly ABG, electrolyte, blood sugar, and urine output. IV fluid 5% dextrose with 0.45% normal saline was used for maintenance, and isolyte-P was used for third space losses. To prevent hypothermia, all IV fluids were administered through hotline tubing, forced air warmer was applied, and higher OR temperature was maintained. Intraoperatively, there was massive blood loss during separation of liver parenchyma and both the babies developed severe hypotension (blood pressure fell up to 42/20 mmHg) and drop in hemoglobin level (4.2 and 4.4 g/dl, respectively). It was managed by bolus IV fluids, implementing massive blood transfusion protocol (also replacing plasma and platelets), and vasopressors. The estimation of blood loss from individual baby was very difficult. In the absence of central venous pressure (CVP) monitoring, the intravascular volume assessment was done according to the vital parameters, hourly ABG, and urine output monitoring. Blood loss was assessed by measuring surgical sponge and calculating drain output from surgical area, although accurate assessment was not possible. Because of excessive IV fluids and massive blood transfusion, patients developed metabolic acidosis (pH 7.21 and 7.23), hyperkalemia (potassium 5.68 and 5.8 mEq l/dl), and hyperglycemia (glucose 320 and 350 mg/dl, respectively), which were successfully managed by IV calcium gluconate and insulin infusion. For persistent metabolic acidosis and refractory hypotension, IV sodium bicarbonate was administered, and for massive blood loss IV tranexamic acid was given. The surgery lasted nearly 8 h. The first baby received 600 ml of total IV fluid (including 100 ml of packed RBC and 80 ml of other blood products), whereas the second baby received 1250 ml IV fluid (including 155 ml of packed RBC and 115 ml of other blood products). Urine output was 215 and 75 ml, respectively, in both babies over 8 h.
After successful separation of both babies, the second baby was shifted to another OR table. As most of the liver tissue was retained in the second twin, in an attempt to close skin, there was increased peak and plateau pressure along with bradycardia, hypoxia, and increased end-tidal CO2. So instead of primary skin closure of the defect, laparostomy was performed in the second baby. At the end of the surgery, both babies were shifted to neonatal intensive care unit (ICU) for further management and were extubated on second and third day postoperatively. On fourth postoperative day, laparostomy closure was done in the second baby. Both the babies were discharged healthy after a month. The key factor in the success of the separation surgery of conjoint twin lies in the multidisciplinary team approach with meticulous preoperative planning and interdisciplinary communication. One should go through the related literature, identify all the potential problems in perioperative period, discussed within the department, and formulate anesthesia plan. The anticipated potential problems in perioperative period were difficult airway management (because of close proximity of the twins), dislodgment of ETT, accidental disconnection of monitoring lines, entanglement of IV line leading to cross-dosing of drugs, presence of cross-circulation, massive blood loss (with difficulty in estimation of blood loss from each individual twin), intraoperative hypothermia, metabolic and electrolyte imbalance, patient position before and after separation, and prolonged surgery. These challenges should also be discussed with pediatrics surgeons and with the neonatologist. The survival after separation surgery depends on the extent and type of organ sharing, presence of cross-circulation, and any associated major cardiac anomalies. The proper and detailed preoperative assessment especially to evaluate the extent of organ sharing is the first and one of the most important step. The presence of cross-circulation in a conjoint twin is a challenging concern as it can lead to altered and unpredicted drug responses in second twin, varying from unplanned sedation to apnea. The presence of cross-circulation can be confirmed by isotopes and contrast studies with technetium-99m sulfur colloid, radiolabeled albumin or RBC, Tc-99m hepatobiliary iminodiacetic acid scintigraphy, or by injecting indigo carmine in one twin and observe for its presence in the urine of other twin. The presence of cross-circulation is also confirmed by observing heart rate response of second twin with atropine premedication of first twin and by observing BIS value of second twin on inducing first twin. In thoraco-omphalopagus conjoint twins, airway management can be difficult. In order to position the patient for intubation, the rotation of head alone may lead to distortion of the upper airway anatomy. This can be avoided by maintaining proper alignment of airway by elevating the second baby over the first baby. Regarding fluid management, the maintenance fluid should be kept on higher side because of large insensible fluid loss from surgical area along with ongoing blood loss. Intraoperatively, it usually becomes very difficult to estimate the individual blood loss due to shared operative field. IV fluid and blood should be guided by intravascular volume status, which itself is reflected by CVP monitoring, serial hematocrit measurement, acid–base status, and electrolytes. In our case, during separation of liver tissue there was massive blood loss, which was difficult to individualize in the absence of CVP monitoring. So intravascular volume was assessed by vitals, hourly ABGs, and urine output. However, in order to maintain mean arterial pressure and hematocrit, large amount of IV fluid and blood product were transfused which resulted in electrolyte imbalance and possibly fluid overload. These surgeries have increased risk of intraoperative hypothermia, so measures should be taken to prevent it by maintaining higher OR temperature, using warm IV fluid, hot water tubing, and forced air warmer. These patients usually require postoperative ventilator support and ICU care. Proper preoperative planning, multidisciplinary communication, and perioperative vigilance regarding monitoring and complications are the key to success in separation surgery in conjoint twins. Our case highlights the responsibility of anesthesia team in anaesthetizing and managing two individual patients simultaneously, and management of anticipated complications such as difficult airway management, massive blood loss, hypotension, and acid–base and electrolyte imbalance. These surgeries have major blood loss and intravascular volume shift. So we emphasize on proper evaluation of intravascular volume status and quantification of blood loss for better management. We felt that even with proper planning and taking care of anticipated problems, it is difficult to manage unanticipated problems during surgery due to complexity of anatomy, surgical field access, and sharing of physiology. Hansen J. Incidence of conjoined twins. Lancet 1975;306:1257. Thomas JM, Lopez JT. Conjoined twins—the anesthetic management of 15 sets from 1991–2002. Paediatr Anaesth 2004;14:117-29. Greenberg M, Frankville DD, Hilfiker M. Separation of omphalopagus conjoined twins using combined caudal epidural-general anesthesia. Can J Anaesth 2001;48:478-82. Shank E, Manohar N, Schmidt U. Anesthetic management for thoracopagus twins with complex cyanotic heart disease in the magnetic resonance imaging suite. Anesth Analg 2005;100:361-4. Kingston CA, McHugh K, Kumaradevan J, Kiely EM, Spitz L. Imaging in the preoperative assessment of conjoined twins. Radiographics 2001;21:1187-208. Szmuk P, Rabb MF, Curry B. Anaesthetic management of thoracopagus twins with complex cyanotic heart disease for cardiac assessment: special considerations related to ventilation and cross-circulation. Br J Anaesthesia 2006;96:341-5. Spitz L, Kiely EM. Conjoined twins. JAMA 2003;289:1307-10.